This recipe for maple syrup is easy. Make it outside over a fire - no mess in the house. Tap several sugar maple trees. You will need 10 gallons of sap to make 1 quart of pure maple syrup. 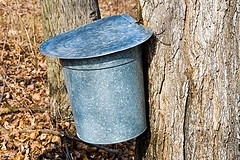 That sounds like a lot, but one tree can easily produce 15-20 gallons of sap in a season. Fill the pan 3/4 full with fresh sap and bring it to a boil. Coat the inside rim of the pan with butter or oil; which prevents the sap from boiling over. Use a candy thermometer and record the temperature when the sap is at a rolling boil; you will need to know this temperature later on. 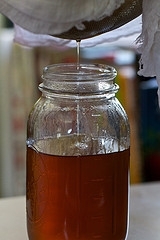 Add fresh sap as it evaporates and boils down; continuing until you have used the full 10 gallons of sap. Check the temperature when you are close to having approximately 1 quart of syrup left in the pan. The maple syrup will be ready when it is 7 degrees above the boiling point. This is why you recorded the temperature earlier. Ladle into a heat proof container and let cool, covered for 12 hours. Pour the cooled syrup into a metal saucepan carefully not to disturb any sediment that is on the bottom (dump that out). On medium heat, you need to get the syrup up to 180 degrees and then pour into hot, sterilized canning jars. Seal and let cool in a draft-free area. Store in a cool, dark place. NOTE: Sap that has condensed into syrup will appear oily as it boils. Do not let the syrup boil below 2 inches on the bottom of the pan; it can burn easily.